The Primacoustic FlexiFuser is an innovative acoustic device that combines diffusion with absorption to disperse high-frequency flutter echo and control primary reflections at the same time. Measuring 24" x 48" (60.96cm x 121.92cm), this full size device is equipped with six variable pitch slats that span the full top-to-bottom height. These are rotated at varying angles to disperse high frequencies to create the desired energy spread that best suits the room and seating position. Behind the slats is a high-density 2" (5.08cm) thick acoustic panel. 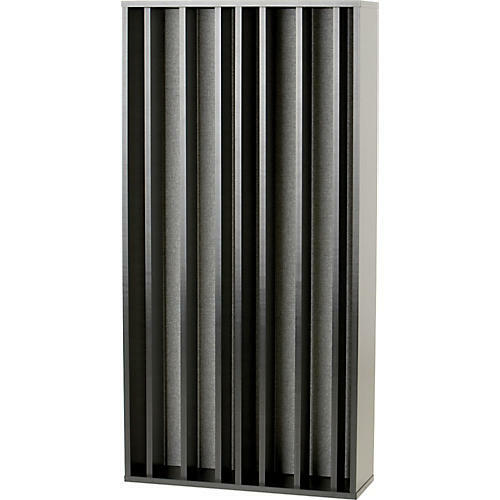 This effectively absorbs directional energy down to 250Hz while eliminating resonant build-up behind the slats. Made from hard, heavy wood composite for maximum reflection, the FlexiFuser ships flat to save freight. Assembly takes less than 15 minutes using standard household tools. When installing the 3" (7.62cm) wide slats, these can be fixed in a predetermined position using the supplied guide pins or left free to rotate after assembly is complete. The absorptive acoustic panel is made from 6lb. high-density glass wool for even absorption right down into the critical lower mid-range zone. Micromesh encapsulated with resin hardened edges, the Broadway panel is then covered in an architecturally neutral color that easily integrates into most room dcors. FlexiFusers are typically mounted behind the listening position in an array of three or more units that span the width of the work area and are hung in place using a simple French cleat. Once in position, they introduce a sense of space and air into the room while absorbing powerful reflections, standing waves and bothersome flutter echo. This makes the FlexiFuser particularly well suited for control rooms, more demanding home theaters and smaller studios where near-wall primary reflections are of utmost concern.